Venturing off the island part of Alameda and onto the bit of the city on the mainland next to the Oakland Airport (strangely, Alamedans refer to the island as "the mainland" and the non-island part as "Bay Farm Island"), I spotted this very gold '71 Monterey. Those of us who have seen Sling Blade know that Mercury is a real good car. I've always assumed that the Mercury in question is a full-size 70s model, like this car. 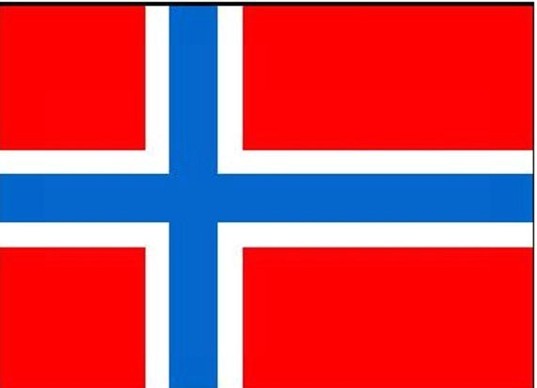 Is it just me, or does that Lincoln-Mercury emblem resemble the Norwegian flag? In any case, you can tell by looking at this thing that the Monterey was class all the way. This one's pretty rough, but most of the pieces are still on or around it and it still drives. No rust to speak of, and aside from the single-digit gas mileage and no-doubt-loose front end, it's likely pleasant enough to drive. 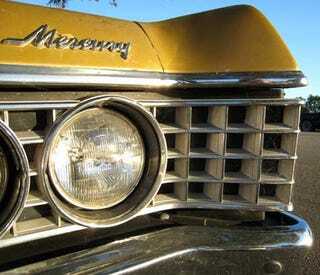 Jeez, how can you not love the extreme grilles Mercury was using in the early 70s? While the Cyclone Spoiler had the craziest snout, the Monterey wasn't too far behind. The 260-horse 400 was the standard powerplant in the '71, but you could get the 370-horse 429 if you wanted. Sadly, no manual transmission was offered in the big Merc. This car would be lots of fun with a warmed-up junkyard 460 bellowing through glasspacks. Come to think of it, I have a set of D0VE-C 429 heads sitting around, just waiting for a big-block Ford-based project. Yes, it's just an LTD with a slightly different body and Mercury emblems slapped on, but put this next to a '71 LTD and which would you choose? Exactly.